Annie D’Innocenzio reported this story for the Associated Press. Phil Dierking adapted her report for VOA Learning English. George Grow was the editor. The American company Walmart is offering something new to its employees: help with earning a college degree. 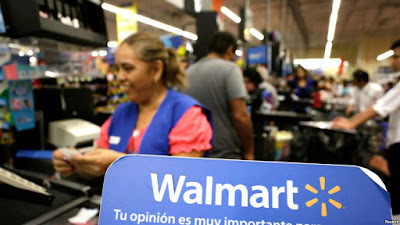 FILE - A cashier smiles beyond a Walmart logo during the kick-off of the 'El Buen Fin' (The Good Weekend) holiday shopping season, at a Walmart store in Monterrey, Mexico, November 17, 2017. Walmart is the largest private employer in the United States. In the past, the company has helped its workers finish high school or pass the General Equivalency Development, or GED exam. The GED is designed to show one’s knowledge of high school-level skills. Walmart hopes the chance to earn a college degree will help it find and keep higher quality entry-level employees in a competitive labor market. Walmart is partnering with a company called Guild Education to offer employees the chance to get a bachelor’s degree in business or supply-chain management. The program will cost a dollar a day at one of three non-profit schools: the University of Florida, Brandman University and Bellevue University. The Associated Press says all three universities have had success working with adult learners and offer programs through the internet. Walmart plans to expand its program to other degrees in the future. It will also offer college-preparation classes for workers who need extra help. The company is paying for the cost of classes, books and other school-related costs so students will not need to borrow money.